Fashion. Comfort. These are the traits that distinguish Ros Hommerson® footwear. Each season, Ros Hommerson brings a fresh perspective to footwear. Her classic styles combine tradition with contemporary colors and embellishments. Unsurpassed elegance and high quality leather craftsmanship serve as essential ingredients in the success of Ros Hommerson. Comfort is always a priority. Ros Hommerson strives to ensure that each shoe fits perfectly. Every pattern is made to her exact specifications and she personally tests them for comfort and fit. 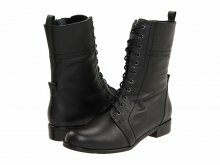 Available in a wide range of sizes and widths, Ros Hommerson boots are made with the customer in mind. Ros Hommerson has a reputation for supreme fit and comfort throughout the footwear industry. When you buy a pair of Ros Hommerson footwear, you buy with confidence. Soft leather ,over the knee, 3 inch heel boots.Never before has an extra wide boot been so provocative .This boot screams ,come get me! The boots feature 17 1/2 to a 19 1/2 shaft height with a 4 inch cuff that can be worn up or folded down for a unique look.Extra wide calves, fully lined,soft insoles and side zipper for easy on and off with nonslip soles.They feature a all the way down side goring for a better fit.This boot has a tapered look and is fitted from the ankle all the way to the shaft.